Beautiful Girl Across the Hall: Are you Henry? Beautiful Girl Across the Hall: A girl named "Mary" called on the payphone in the hallway about an hour ago. She said that she's at her parents and that you're invited to dinner. Henry Spencer: Well... thank you very much. © Copyright 1976. David Lynch. © 1976 O.K. Paul Music. Q: Who is the Man in the Planet? Q: What is David Lynch's interpretation of this film? Q: What are the "Glen or Glenda" references? I sometimes dream of waking to a completely dark world, a world with no sunlight and minimal artificial light. My vision is blurred, but there is nothing to see. The streets are virtually empty, and my friends and family are lifeless; sitting, standing or even walking, but with nothing to do or say, and nowhere to go. No questions are asked because there is nothing to learn, nothing is discussed because nothing is interesting. And it is this dismal reality I am faced with, only partially aware that there is anything better. The existence I dream of is somewhat reminiscent of the world of Henry Spencer, the main character in Eraserhead, who becomes father to a hideously deformed baby. That's what the film is about at face value, but the very style in which it is portrayed is the real beauty of it. The setting and scenery makes the film one of the most desperately depressing I have ever seen. And although Henry seems to be devoid of any spark of personality, we can't help but sympathise with him throughout the film. Similar to my dream, the only form of light is artificial, the streets are virtually empty, and the only person in the entire film who has any personality is the father-in-law, and the only thing he has to talk about is his poor health. He also seems to be the only one with any link to better times. ("I've watched this city turn from pastures to the hell-hole it is now.") The city they live in is completely industrialized, and the only plant life seen is dead, and in a pile of soil on Henry's bedside table. Some have suggested it is based after a nuclear holocaust, but nothing is explained to any conclusion. One of the beauties of this film is that it practically begs the viewer to decide for themselves what any of it means, and there are many theories. I warn you not to read the message board of Eraserhead before you see the film, as it is so much more powerful and chilling to experience it first-hand. The first time I saw Eraserhead, I was completely confused. It is possible that David Lynch just put a load of random imagery together and called it a film. Maybe he wanted the viewers to put it all together and make their own sense of it (or not). On the other hand, there might actually be a set formula behind it and only the very open-minded and discerning audience can properly decipher it. One viewing of Eraserhead is enough to raise about a dozen questions, and to leave you gasping for answers. Two viewings are probably enough to give you theories about some of the cryptic depictions hauntingly portrayed. Three viewings might be enough to give you a completely different set of theories, battling persistently against your previous conceptions, but still leaving just a few details that don't quite seem to fit in. The truth is that there may be parts that don't make sense in one interpretation, but fit in perfectly to another. You could probably watch Eraserhead several times, and each time see a slightly different story. Or if you were to ask six different people exactly what Eraserhead is about, you would get six different answers, each equally correct in their own right, and each equally confused. That being said, this definitely isn't a film for everyone. This is the first Lynch film I have seen, and it certainly won't be the last. But there will no doubt be many who see this purely as a lot of clever mind tricks and special effects (for its time, anyway.) There will be those who don't like much to think about, and want it all explained bit by bit in perfect detail. Well, Eraserhead is an epitome of everything such moviegoers will hate. I will say this for certain: If your favourite films are 'Love Actually' or 'Dude, Where's My Car? ', you probably won't get much out of Eraserhead. But for those who like their concepts challenged once in a while, this film will probably be one to watch again and again until you understand. This is also not a film to be forgotten easily. 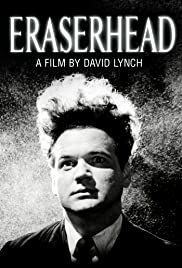 Love it or hate it, Eraserhead will stay with you for a very long time. 265 of 342 people found this review helpful. Was this review helpful to you?